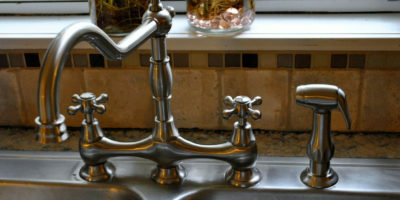 3 Should You Install A Kingston Brass Faucet In Your Kitchen? Kingston Brass is a faucet manufacturing company that was founded in 1998. Since its founding, the company has been developing great looking faucets. Did you know that Kingston Brass is renowned for their antique-styled kitchen faucets? Even though most of the faucets they produce are designed to resemble the faucets used until the 20th century, all of them come with every feature you might expect from a modern faucet. Kingston Brass produces some of the best-looking classic faucets currently available on the market, and their products have decent prices. In the following article, we present some of the features that make Kingston Brass faucets relevant in today’s market. Further, in the article, we present a short selection of Kingston Brass reviews in which we reveal the pros and cons of their products. For more information about this manufacturer, read the article below. If you’re looking for a modern faucet that will enhance the appearance of your kitchen, you have to take a closer look at the Kingston Brass Concord KS8711DLLS. 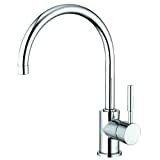 This model combines elegance with simplicity, and the result is a stunning faucet that will look great in every kitchen. This faucet has a single-lever design. The single handle controls both the water volume and the water temperature, and it makes it easy for you to make small adjustments. The faucet uses a ceramic disk cartridge that increases its functionality and durability. 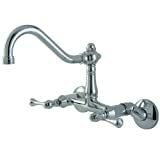 This is a nice-looking faucet that will look great in most kitchens, whether they have a modern or a traditional design. Sophisticated Design – This faucet has a simple yet sophisticated design. The faucet’s design will enhance the appearance of every kitchen. Durable – The faucet is made out of solid brass, so it is very durable. The ceramic cartridge increases its durability, and you will be able to use the faucet for a very long time. No Sprayer – This is a good faucet, but it might have been better if it has a sprayer. 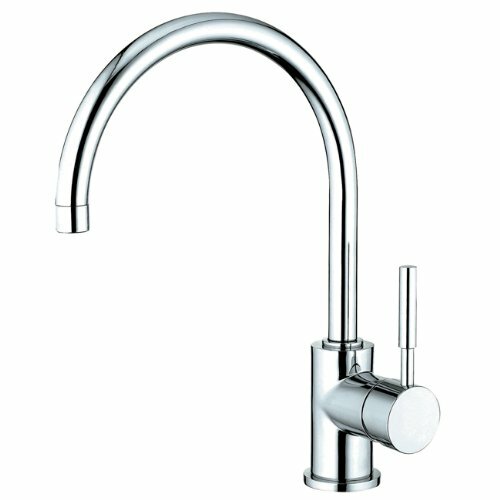 Conclusion: The Kingston Brass KS8711DLLS is a very good faucet that will look great in both traditional and modern kitchens. When you have to change your old faulty faucet, or when you want to build a new kitchen, you have to buy fixtures that will endure the test of time. And that doesn’t mean you have to find durable fixtures, you also have to find some that will look great in the years to come. The Kingston Brass KB751 is a traditional looking faucet that has a high arch design and comes with two handles. The handles have a 0.25 turn mechanism, so it will be easy to adjust the water volume and temperature. The faucet’s gooseneck spout will rotate a full 360-degrees, so it will provide a good clearance around the sink. High-Quality Finishes – The faucet comes in multiple finishes, and all of them are very good. The finishes are resistant to scratches and chipping, and they also do a great job at hiding stains. High Arch – The high arch of the spout will allow you to clean large pots and pans without any troubles. 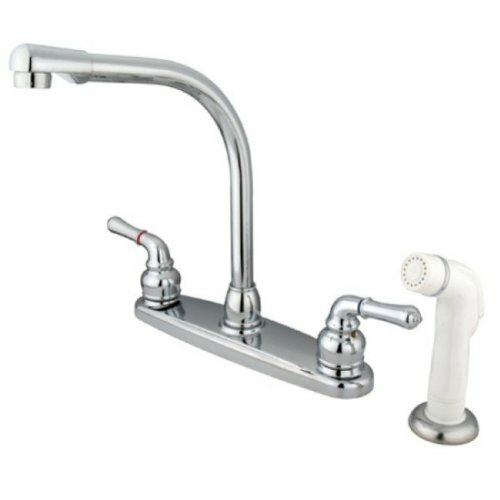 White Sprayer – This faucet comes with a white plastic sprayer. While having a sprayer is good, the fact that it won’t match the faucet’s finish is a disadvantage. If you’re planning on redecorating your kitchen, and you’re going for a traditional-styled one, you have to take a closer look at the Kingston Brass KS2798BLBS. This faucet looks amazing, and it will enhance your kitchen’s design. The faucet has a high-arch design and comes with two handles. The handles have a 1/4-turn control mechanism that will turn the water on and off. The faucet’s spout rotates a full 360-degrees. This faucet uses a ceramic disc valve, so you will be able to enjoy using it for a long time without any drips and leaks. Elegant – The faucet is styled like an 18th-century faucet. This makes it an ideal choice for anyone who wants to make their kitchen look better. Aerator Included – Even though the faucet follows the 18th-century style, it comes with an aerator. Using an aerator will lower your water consumption. Brass Sprayer – The included brass sprayer looks good, and it definitely looks better than the plastic ones. However, there is a problem with using a brass sprayer. When you use it with hot water, the sprayer tends to get hot as well. 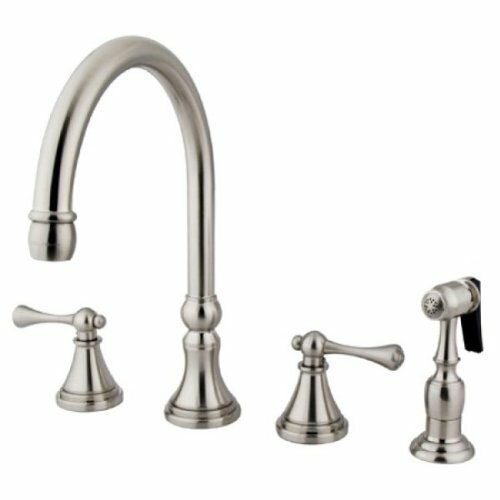 Conclusion: The Kingston Brass KS2798BLBS is a great looking faucet that will become the centerpiece of a traditional-styled kitchen. The faucet comes with a brass sprayer that looks great but can get hot. When you’re planning on remodeling your kitchen and transform it into a traditional-styled one, you should consider including the Kingston Brass KS3221BL in your shopping list. This faucet has a great design resembling the faucets in the classic American style, and it will improve your kitchen’s appearance. The faucet comes with 2 Buckingham handles that have a 1/4 turn mechanism that turns them on and off. The spout rotates in a 360-degree radius, so you won’t encounter any problems when you want to clean larger pots and dishes. The faucet’s body is constructed out of solid brass, and it uses a ceramic disk cartridge so you will be able to use the faucet for a long time without any problems. Glamorous Design – This is a great looking faucet that will make your kitchen look better. If you’re looking to impress your guests, this faucet is a safe bet you will. High Quality – All the components used for the construction of this faucet have a high quality. This makes the faucet very durable and highly functional as well. Wall Mounted – While having a wall mounted faucet will make your kitchen look great, you will struggle more during the installation process. If you’re not experienced with installing faucets, you might need professional help. 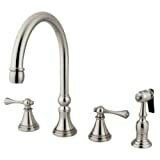 Conclusion: The Kingston Brass KS3221BL is an amazing faucet that will look great in every traditional-styled kitchens. This model might be harder to install than others, but the struggle will be worth it. Kingston Brass is a company based in California, USA. The company started in 1998, and since then they have been working diligently to develop some of the best kitchen faucets on the market. Since the founding of the company, Kingston Brass has been expanding and innovating. Their goal is to invest in quality and value, and most of their products not only look good, but they incorporate some of the latest technologies available to deliver a great experience. This company is always working to come up with innovative designs that will reinvent and redefine your kitchen. Some of their products have original designs that look great, and others have classical designs refined for modern use. 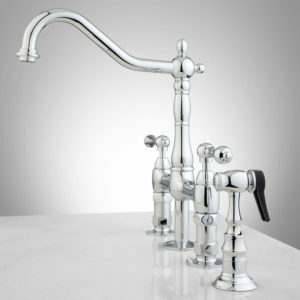 Even though the faucets might look like antiques, they will perform as good as you might expect from a modern faucet. One of the major advantages of buying a Kingston Brass faucet is that it will become the centerpiece of your kitchen. The faucet will turn heads and it will receive a lot of compliments from your guests. With a decent price and interesting faucet designs, Kingston Brass is a faucet manufacturer that’s bound to have an impact on the fixture market. Should You Install A Kingston Brass Faucet In Your Kitchen? You might be wondering what should determine you to choose a Kingston Brass faucet over the ones developed by the competition. After all, this is not yet a world-renowned manufacturer. So, in the following section, we decided to take a closer look at this manufacturer’s products and determine what makes them special. Kingston Brass produces a lot of faucets. Some of them have a modern design, and others have a classical one. The characteristics of every faucet are different, but all of them share some of the following. – One of the most important features of every Kingston Brass kitchen faucet is its design. Whether you choose a modern-looking model or a classical-styled one, you can be sure the faucets will look great in your kitchen. – All the faucets produced by Kingston Brass have a solid brass construction. This makes them durable, and resistant to rust and corrosion. This will improve the faucets’ longevity. – Every faucet benefits from a high-quality cartridge. Whether it’s a ceramic cartridge or a washerless one, you can rest assured the cartridges will provide a leak-free operation for a very long time. – Kingston Brass faucets use either a single handle or two handles at the same time. All of them are good, and they will allow you to adjust the water flow and temperature easily. – All the faucets produced by Kingston Brass come with a spout swivel. This is a great feature, as it will allow you to clean large pots, pans, and dishes with ease and it will provide clearance around the faucet. – Kingston Brass faucets come with tall spouts. This will provide more clearance above the sink, so you will be able to clean the dishes without bumping into the spout. – All the finishes used for Kingston Brass faucets are scratch-resistant, so they will look as good as new for a very long time. The finishes are also stain-resistant, so they will mask the water stains and fingerprints. – These faucets are easy to clean. You don’t have to use cleaning products when you clean them because the products might harm the finishes. You just have to wipe the faucet with a wet rag and then with a dry one and they will look as good as new. If you don’t know what part you need to fix the faucet, you should contact the manufacturer’s customer support service. All Kingston Brass kitchen faucets come with a 10-year manufacturer warranty. The warranty covers all the defects that might have been caused due to bad craftsmanship or material error you might encounter during this period. The manufacturer will send you any spare parts you might need for free, and if the situation demands it, they will send a new unit instead. Keep in mind you have to own and present a valid receipt if you want to benefit from the warranty. You can contact Kingston Brass’s customer support service via email or phone. The customer support specialists will be very helpful, and they will be of great assistance in identifying the problems your faucet might have. Kingston Brass implements some of the latest technologies in their faucets. Despite the fact that most of their faucets look like antiques, they will work as well as any modern models. 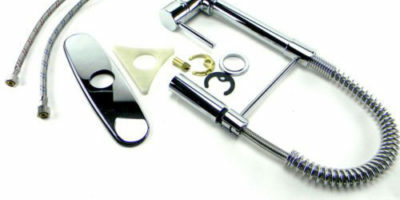 – All the faucets come with high-quality cartridges and valves. This will allow you to use them for a very long time without experiencing leaks. – Some of the faucets produced by Kingston Brass are designed to be wall mounted. While the installation process is slightly harder for these faucets, they look great. – Most of the faucets come with a sprayer. The sprayer will be of great help in the kitchen. – Even though they’re designed to look old, the faucets come with aerators that will lower your water consumption. Kingston Brass is a faucet manufacturer that produces delightful models. 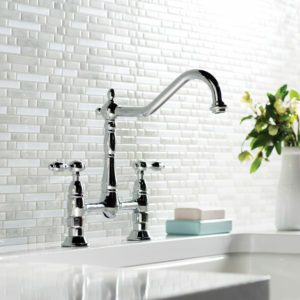 Some of their best products are styled in a similar way as the faucets people used in the 18th, 19th, and 20th century. Even though their faucets look like antiques, they incorporate some of the latest technologies that allow them to function just as well as any modern faucet would. We’re certain that after reading our short Kingston Brass reviews you are now able to determine which is the best model for your home. If you plan on styling your kitchen in a classical or traditional way, there are a few manufacturers that can come close to offering similar models with those developed by this company. Kingston Brass is an up and coming faucet manufacturer, and you should keep your eyes on this company because we believe they’re bound to develop great models in the future.